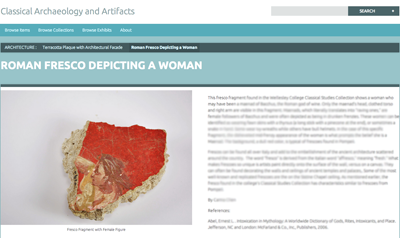 Three classes in three different academic departments (Classical Studies, Education, and Art) recently piloted the use of Omeka in their coursework. Omeka is an open-source digital collection and access platform that allows users to create online collections and exhibits and to display scholarship. The Digital Scholarship Initiatives program worked with faculty to create collections, provide student training, hold computer lab working sessions, and design assignments using this platform, as well as providing full server administration and site customization services. Mapping the "White, Marmorean Flock"